From June 10 to 16, 2018, the Tongji – Cambridge postgraduate international academic conference on the theme “Technology · Design · Business” was held at Cambridge university, UK. The conference is funded by Tongji University’s International Cooperation Training Program for Postgraduates and co-sponsored by the Inclusive Design Research Center of College of Design & Innovation, Tongji University and the Engineering Design Center of Cambridge University. Teachers and students from the two universities had in-depth academic exchanges around the theme of ” Technology · Design · Business “. Preparations for the meeting began in December 2017. All preparations for the meeting were successfully completed on June 16, 2018 through public essay solicitation, essay defense, determination of the list of selected students, and rehearsal defense before going abroad. The graduate students in our university come from the backgrounds of design, architecture and communication respectively. The specific research involves various topics such as inclusive design, interactive design, urban planning, artificial intelligence, etc. Under the background of increasingly prominent interdisciplinary characteristics of design, this meeting has had a positive impact on improving the international exchange level of graduate students, enhancing academic exchange, expanding international academic vision, promoting the integration and transformation of different knowledge, and multi-disciplinary cooperative research. Cambridge University is one of the world’s famous research universities and the second oldest university in the English – speaking world. According to the World University Influence Ranking released by Wikipedia in December 2015, Cambridge University is ranked No.1 in the world. The Engineering Design Center of the Engineering Department of Cambridge University and the Inclusive Design Research Center of Tongji University have been in close communication, especially in the fields of inclusive design research and related aging design, medical and health design research, automobile design research and so on, which have similar themes but different characteristics. So far, two masters from the inclusive design research center have gone to Cambridge university’s engineering department to study for their doctorates. At the same time, professor Dong Hua is a member of the organizing Committee of the biennial CWUAAT conference hosted by the engineering design center of Cambridge university. The Tongji University Graduate International Academic Forum project provides a good opportunity for cooperation and exchange for this meeting. It enables our students to have a personal feeling and understanding of the scientific research situation in top international universities and promotes more and higher quality cooperation and exchange between the two sides in the future. This meeting is divided into three parts: the main body of the meeting, workshops and laboratory visits. The meeting was held in the engineering department of Cambridge university. professor Dong Hua of College of Design & Innovatoin of Tongji university introduced the meeting first. then professor John Clarkson of the Engineering Department of Cambridge university and Dr. Ying Jin of the School of Architecture made opening speeches for the meeting. They first expressed their congratulations and support for the holding of this meeting. Professor Ying Jin also shared his team’s research in the field of urban transportation. After that, the participating students gave a keynote speech. In the lecture on the theme of “Urban Planning and Design”, Xie Chen, a graduate student from College of Architecture and Urban Planning, elaborated on the spatio-temporal factors of using cell phone signal data to identify workplace and residence and their impact on the results. Yang Tianren, a Ph.D. student from Cambridge University’s School of Architecture, introduced a method based on the evolution of multi-center city morphology to see the emerging city morphology of Greater Shanghai from multi-source data. Subsequently, Chen Bowen, a graduate student from College of Architecture and Urban Planning, described his own empirical research method, taking city streets at night as the research object, exploring what kind of streets can make citizens feel safer at night. The second presentation took “new technology, new media and design” as the theme, and Yan Ming, a graduate student from Tongji university’s College of Arts and Media, analyzed the application and development of vehicle-mounted interconnection and human-computer interaction technology in driving training. on this basis, a driving assistance interaction system based on vehicle interconnection technology was proposed, and a vehicle control system was also developed. Liu Ying, a graduate student from Tongji University’s College of Design & Inovation, discussed the feasibility of replacing designers with artificial intelligence from the perspective of the theoretical basis and working mechanism of artificial intelligence through literature analysis and case studies. This research aroused great interest from scholars on the spot, and we had a heated discussion on it. In the final speech on the theme of ” service design and inclusive design”, Zhao Ru, a graduate student from Tongji university’s College of Arts and Media, studied the new trend of corporate public welfare communication in the new media age through case analysis. On the basis of on-the-spot investigation, Wang Lu, a doctoral student from Tongji University’s College of Design & Inovation, discussed how emotions affect service quality in human interaction. At the end of the meeting, Ning Weining, a Ph.D. student from the Engineering Design Center of Cambridge University, took designers as his research object and discussed the evaluation method of cognitive rejection in inclusive design. The whole forum was held in a serious and active atmosphere, with participants actively speaking and asking questions and actively discussing. In the workshop on the second day, Dr. Per Ola Kristenson from the Faculty of Engineering of Cambridge University and other scholars presented a wide range of lectures, including the study of the distance between mobile phone keyboards on false touch, integrated system design, user performance perception modeling, etc. In the course of the speech, they also constantly raised questions to discuss with our students. Among them, when discussing the design problems in virtual reality, students from our university also experienced the relevant virtual reality equipment and virtual gesture interaction technology, and had a more real experience of the new technology. The students are responsible for the organization, preparation and execution of the conference. This project provides excellent training opportunities for graduate students’ organization and coordination ability and international communication ability. In addition to the project, the graduate students attending our school also contacted Tongji University alumni studying in Cambridge University and visited relevant laboratories and research centers under their leadership. The whole meeting and related activities were richful and varied, and the students at the meeting felt quite a lot. The meeting achieved fruitful results. This project provides an good opportunity for our graduate students to have personal contact and in-depth understanding of the teaching and scientific research modes of top international universities. Especially for the first-year graduate students with less scientific research experience, they can also participate in international academic conferences and learn and exchange the latest research results in their respective fields while visiting the world’s top universities, which will have far-reaching and beneficial effects on their future research. 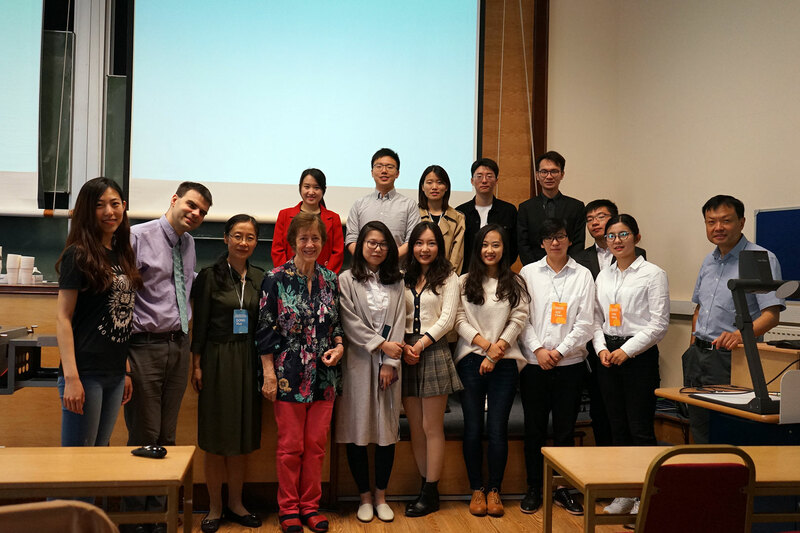 In the summer of 2019, Tongji University will organize graduate students to Cambridge University for the fourth time to hold an international academic conference for graduate students.